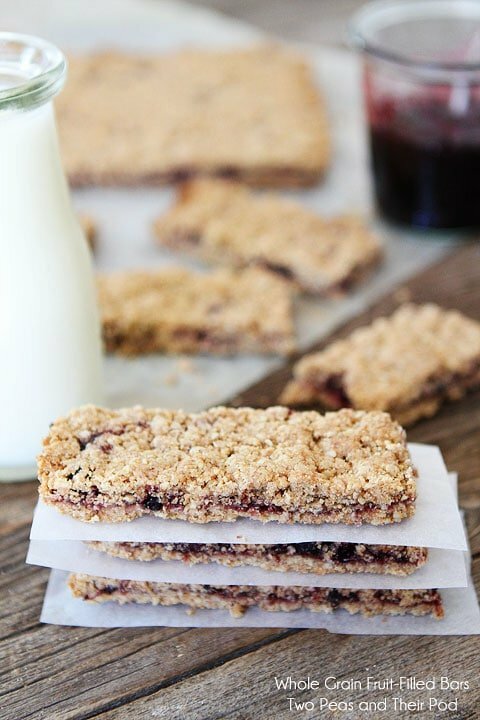 Homemade Whole Grain Fruit-Filled Bars are the perfect back to school treat! Kids and adults will gobble up these bars! Back to school doesn’t mean we can’t have fun though! To kick off our “school” year and new routine we made Whole Grain Fruit-Filled Bars. These bars are fun to make and fun to eat! 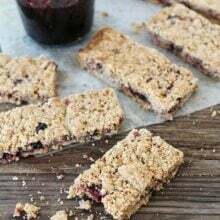 The recipe for Whole Grain Fruit-Filled Bars comes from Catherine McCord’s new cookbook, Weelicious Lunches. Catherine’s first book is a favorite at our house so when she told me she was writing a second book all about healthy lunches, I started counting down the days until release date. Well, it’s here and the book is fabulous! 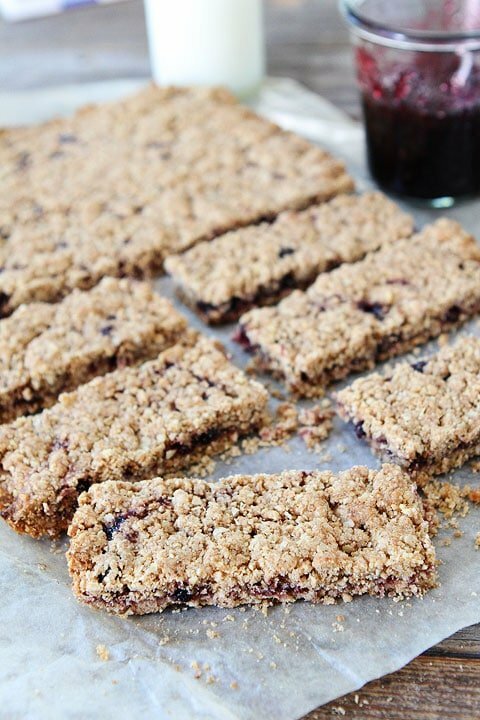 But let’s talk about these Whole Grain Fruit-Filled Bars. I never buy packaged granola or fruit bars at the store. Most bars have ingredients that I can’t pronounce and are expensive so I stay away. I always make homemade granola bars, but haven’t tried making a fruit bar. 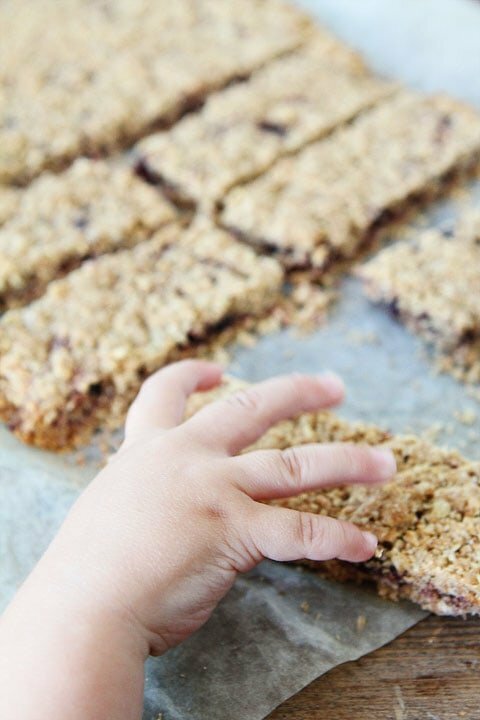 So when I saw Catherine’s recipe for Whole Grain Fruit-Filled Bars I knew I had to try them! 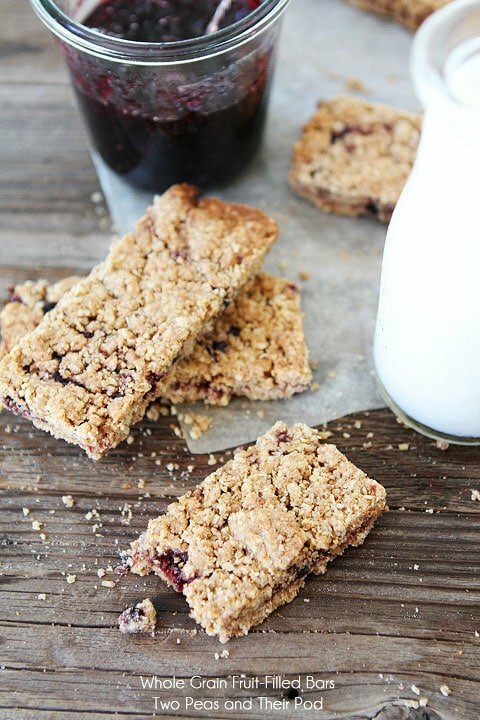 There are only seven ingredients in these bars and I can pronounce all of them:) I love that they are made with whole wheat flour and oats. You can use your favorite jam or fruit preserves for the filling. I went with homemade triple berry jam that our friends gave to us. 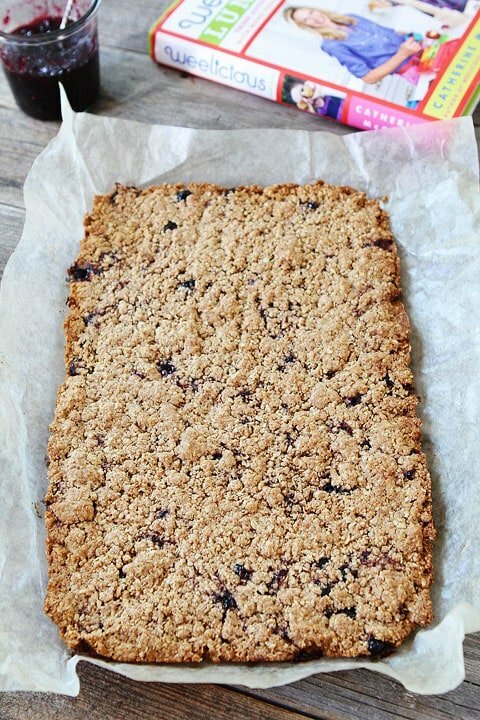 The bars have a buttery whole grain crust with a sweet fruity filing! They are the perfect treat for school lunches or an after school snack. They are easy to pack and will keep in the refrigerator for up to a week. So you can make a pan and ration out the bars during the week. I tried to ration out our bars, but they went quickly. Caleb wanted a taste as soon as they came out of the oven! 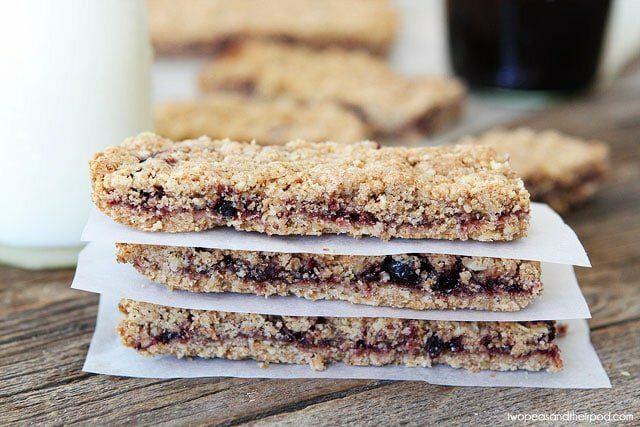 Whole Grain Fruit-Filled Bars are the perfect back to school or anytime treat. 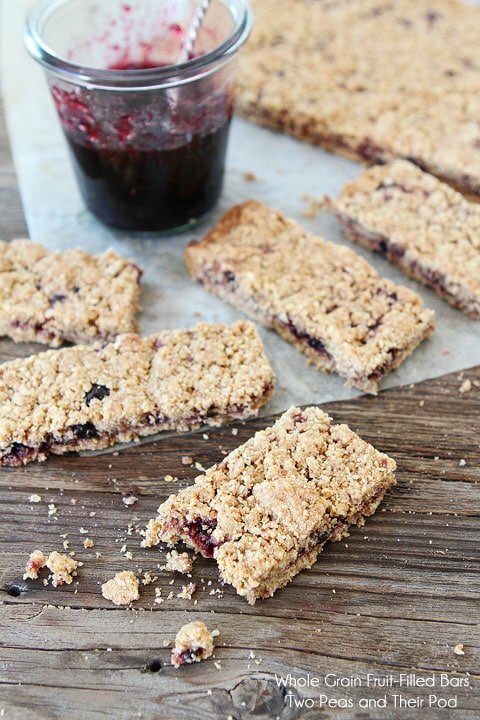 I know we will be making these homemade fruit bars all of the time! And make sure you check out Catherine’s blog, Weelicious, for more healthy kid-friendly recipes! And if you want a daily dose of lunch inspiration follow Weelicious on Instagram. Every day Catherine posts a photo of a healthy lunch box. She has the best ideas! I want to be Catherine when I grow up! 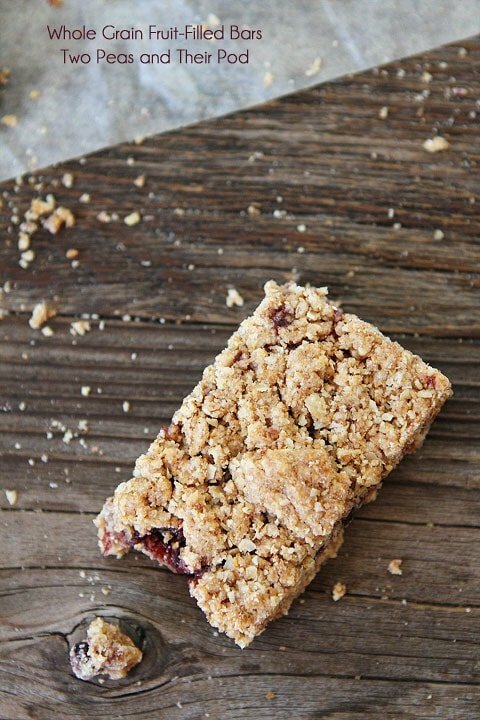 Homemade Whole Grain Fruit-Filled Bars are the perfect treat for school lunches, an after school snack, or grabbing on the go! 2. In the bowl of a food processor, combine the flour, oats, brown sugar, and salt. Pulse for 30 seconds. 3. Add the butter and cold water and pulse until the dough holds together when pressed. 4. Grease a 9x13-inch baking dish, line it with parchment paper, and grease the parchment paper. 5. Divide the dough mixture in half and press half into the prepared baking dish, using the back of a spatula to press down evenly. 6. Spread the preserves evenly on top of the dough. Sprinkle the remaining dough evenly on top of the preserves and gently press down using the back of a spatula. 7. Bake for 45 minutes, or until golden brown. 8. Cool, cut into 1 1/2 x 4-inch bars, and serve. Note-bars can be stored at room temperature up to 3 days or refrigerated for up to a week. I’ve never even thought of trying to make my own fruit bars at home. These seem so easy and look delicious too! Catherine’s recipes are some of the favorites in our household and I am sure this one will be right up there with her vegetarian enchilada casserole! 🙂 Thanks for sharing! These look great and I love how few ingredients there are! This is something I would make. Love it! Thanks! These sound delicious, Maria! I’m sure the kids would gobble these right up! I love all the recipes I have been seeing form this cookbook. It sounds like a great on and is being added to my growing wish list! These bars look great and I love the shot with Caleb’s hand. Too cute! I’m sure my kids would love these. What a great alternative to the store bought junk. Thanks for sharing! I love these! I can see my kids eating these for breakfast, with their lunch and after school! I can’t wait to try these! What nice kid friendly bars! These look like the perfect whole-grain substitute for the not-so-good store bought version. That lunchbox book looks SO adorable, can’t wait to read! these look like the perfect “dessert” for my little munchkins lunches! I might not have kids but these would be great in my own lunch bag! These are so awesome. Such a great idea for having healthier snacks on hand at home. Yummy, these bars look delicious! I love leftovers for healthy lunch options. With my oldest just starting kindergarten this is a perfect snack for his younger brother and I to make for us all to enjoy as a after school treat! These look yummy! My kids aren’t big fans of jam/preserves but I’m going to give these a try. I wonder if you could use peanut butter or nutella instead? I love this idea a cannot wait to use it! I have been looking for some great lunch ideas for my preschoolers. I am over all of the processed foods that I am spending way too much money on at the store. I want something great and nutritious for all of us. Can’t wait to try this recipe I have been looking for a good homemade fruit bar(this one looks delicous),hubby is diabetic and this one has whole grain instead of flour which is better plus I make fresh fruit to put in it with splenda,going to go to Barnes and noble to try and find the book weelicious,can’t wait to try more recipes. Thanks for sharing Two Peas in the Pod! Oh! I just love that pic of Caleb’s sweet little precious hand taking a fruit bar,What a great memory you have with that one lol. This looks like the perfect, healthy snack I can make for my hubby! I don’t have kidlets yet, but I know he would love them! I love a good nutritious and easy recipe. Sounds yummy! I’m going to try this today with some GF flour instead of the whole wheat flour. 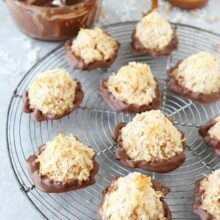 We will be making these tomorrow (just made your Zucchini Coconut cookies yesterda – SO DELICIOUS). These bars sound incredible! Perfect for snack time. These bars look fantastic, Maria! Love that the ingredient list is so simple and they’re so wholesome! Wonderful recipe for snacks. These look so yummy! I will have to try them out! Who doesnt love jam and butter! mmmmm! I adore her new cookbook! So many great recipes! And I love the picture of Caleb’s hand reaching for a bar. Adorable! LOVE IT! It’s so healthy too. can’t wait to do it now. Any suggestions for something other than jam? I’d really like to use real fruit instead. such a perf snack! I’m loving Catherines new book too! Great giveaway!! And these are the perfect healthy snack! These look just the right consistency. I pinned your fave recipes too. Thank you! These look awesome! Can they be frozen? Also, can I used Rolled Oats instead of Old Fashioned Oats? I haven’t tried freezing them, but I am sure they would freeze just fine! Yes, use rolled oats! I just bought some fig jam – I bet this would make some delish fig bars. Thanks! I keep a look out for what I call ‘breakfast cookies’ and this might fall in that category – a quick go to on the way out the door! I’ve seen so many good reviews of this cookbook! I met Catherine two years ago and she was such a sweetheart. These bars look fabulous. If we don’t have a food processor, it that step needed? If so any ideas on what we could use? Can’t wait to try these! You could cut the butter in with a pastry cutter or two forks. Just work it really well! I second Katie’s question (glad I’m not the only one out there). Would definitely like to try these; maybe a friend with a food processor is the answer. I answered Katie! 🙂 You can use a pastry cutter or two forks, just make sure you work the butter in really well! I love these Maria! I always used to have fruit bars with my mom – they always remind me of being a kid. These sound tasty! I’m trying to accept that summer is officially over too. I will have to try these out to send with the kids! I have to try them! They look so delicious. A great healthy snack for anytime of the day. The bars look delicious! Will try this in our blender. These bars look amazing! I can’t wait to try them…they’d make a great breakfast on the go or anytime snack. I can’t wait to try these. My 18 month old likes cereal bars and we get them for convenience’s sake but those ingredients are awful. I think he will love these and they look easy. I can’t wait to buy Catherine’s book! Catherine’s book has so many great ideas and tips. I need to make these bars!! What a great recipe for back to school time. Could I use Polaner All-fruit instead for the filling? These look so good right now!!! Made these today! 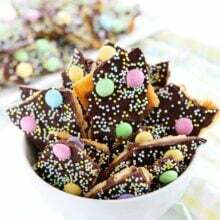 So easy to make and they are yummy. Used the homemade blackberry jam my husband made this summer. I think I would add a little more jam next time! Yum – might try with coconut oil and see how they turn out. We’ve been given a lot of homeade jam this summer and this seems like a great way to use some of it. I think I’ll start with the blackberry. My husband loves fruit cereal bars, these look fab! Would love to try making these as I have a granola bar for a snack each day at work. Looks delicious!!!! These bars are fantastic. I make a coconut one but wanted to try this one. My kids loved them!! Are these a soft bar? Similar to a Nutrigrain bar or fig newton or crunchy like a granola bar? Made these last night with my 5 yer old. I do not have a food processor so the crust was a little bit of work but well worth it, they turned out delicious! My daughter could not wait til they cooled off so he had one warm and loved it. I had one this morning for breakfast and also loved it. Thnks for having the recipe. The only things changed was I used about 1 cup of fruit preserves because 3/4 just didn’t look like enough to us. Is there something that I can substitute for the butter? I was thinking applesauce, but I am unsure on the consistency and how much of the applesauce to use? I made these last weekend and me and my husband ate them throughout the week for breakfast and they are awesome!!!! Just trying to reduce the butter. Yum! These are great. Love that you don’t really need anything special on hand. Definitely plan to try more flavors! I made a half batch and there’s nothing left. No kids to excuse that on…theses are definitely going to be made again. I bet they’d be great with some crystallized ginger or lemon zest in the crust. I just made these today with my homemade strawberry preserves and they are delish! My two teenaged boys think so too. 🙂 I’m tired of buying various bars and things that have all kinds of weird ingredients in them, so these are a refreshing easy change! I calculated a large sized bar at 6 WW points, and even a smaller size would be a great snack! Thank you for sharing this great recipe. Any idea if applesauce in place of some or all of the butter would work? That’s an awful lot of butter! Love these! I had done several variations with preserves and my husband asked if I could make some with apples. I’d never heard of “apple preserves”, but I did find some chunky applesauce. I added cinnamon to the crust when I made them for him and they came out tasting like an apple crumble! It was delicious! Great recipe, thanks for sharing! I’ve made these 2 weekends in a row now and they never seem to last more than 3 days in our house (2 adults, no kids), no matter how small we cut them up. So yummy with milk or tea. I’d love to know if we could replace/cut back on the butter, too, like Elizabeth. Love these bars, but so much butter! I also subbed 1/2 cup almond flour for 1/2 cup of the whole wheat flour because I have blood sugar issues. I made these last night since school started again today, and they are totally delicious! I used lingonberry jam, and it is super yummy. I know I’ll have lots of fun playing with different flavors in the future. They were so easy, my son will be able to make them too. 🙂 Thanks so much for sharing the recipe! When you say “baking dish”, do you mean a 9×13 cookie pan or a 9×13 pyrex dish? I made these today, they seem great but there is NO way that mixture would have covered a 9×13 dish, I had to put it in a 8.5×11 dish and it only just fit. I made these today and they are awesome! My very picky 5 yo daughter loves them. Thank you. What it work if I used oil and applesauce and place of the butter? I would prefer not to use that much better. My son has a dairy intolerance. I haven’t tried appelsauce and oil. Let me know if it works for you! These are wonderful! My husband loved them and said they were one of the best things I’ve ever made. I love that they’re not too sweet and I know exactly what is going into them. My toddler was not a fan, but it’s ok- he doesn’t like anything. 🙂 I used organic strawberry jam from Trader Joe’s – delicious! Thank you! You are welcome! I am glad your husband loved them! Any suggestions on how you can add veggies into the filing? I’ve been making these for about six months, they are really great. However, I was comparing them to Nutrigrain bars for nutrition because I was going to use the recipe in a Sinners vs Saints recipe contest with family and they are really high in fat and sugar when you break it down- 12 grams of fat per bar, 17.5 grams of sugar per bar. Any tips to reduce those numbers? I will have to play with the recipe to reduce the sugar and butter. Maybe try coconut oil? Made these a few days ago…pan is almost empty. I love the oatmeal bars that they sell in the bakery at Whole Foods, but I’m tired of spend $2-3 every time to buy one. I ground up the oats so I had a smoother blend. I think I may need to use more butter because I had some crumbling in the bar. I used an entire jar of my mom and dad’s blackberry jam. Will definitely use this recipe again. Thank you for sharing! Hi Mrs. Maria and Mr. Josh. I am a student at Loma Linda Academy and a writer for the school newspaper. 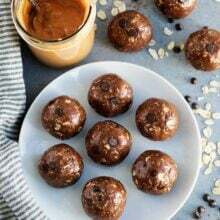 Do you mind if I publish your recipe in the newspaper for my article about healthy snacks? Thank you so much for your help! Does anyone have a suggestion for a good brand of whole wheat flour? I recently switched to using whole wheat flour with my baking and the last time I bought a bag I made cookies and they were very gritty. Also, they had a different texture to them. Any suggestions are appreciated. can i replace the old fashioned oats to quick oats or instant oats? Was wondering if I could freeze these? I haven’t tried it. Let me know if you try it! Made these during the weekend snow storm..Mine are crunchy . Are they supposed to be crunchy? I added extra jam…Very good!!!! Made these bars according to recipe they were delicious…we used some delicious plum preserves that is a little tart. These are great for an adult breakfast too. They are very hard to resist.